This article was published in the April 2015 issue of Harper’s Bazaar Arabia. Download a PDF of the piece. Qatar is sometimes described as a country that “punches above its weight.” It is bold, it is ambitious. It dreams big, aims high and sees the sky as no limit. Perhaps the same could be said of its women. As the Gulf nation charges ahead with its ambitious development plans, Qatari women are emerging as almost preternatural paragons of motivation and talent. One day they’re clocking in long hours at their day jobs, often in the country’s top government and nonprofit agencies, and the next they’re entrepreneurs launching lucrative side businesses or philanthropic ventures. They juggle hobbies, family, friends and career plans. They work hard and dream that their efforts will advance Qatari society. And they do it all whilst impeccably dressed. Maryah Al-Dafa is one such woman. The 29-year-old Qatari owns Eqlipse, a multi-brand boutique that she co-founded with her sister, Maram, 21, in 2014. Located on the The Pearl-Qatar, Eqlipse features an array of regional and international designers, such as Vera Wang, Jason Wu, Nicole Miller and Badgley Mischka. It is there that I first meet Maryah and her sister, and as they later explain to me, the boutique is as much a reflection of their own individual tastes as of their dynamic as progressive siblings in business. “Because our personalities are very different, we couldn’t agree on anything – name, logo, style… So the eventual agreement was that Eqlipse would be split. My side would be the more eveningwear, formal side, and her side would be the funky, casual chic side,” Maryah explains. This split is subtle but apparent when entering the boutique. On the Maryah’s left side striking Vera Wang and Nicole Miller gowns, statement blouses by L’Wren Scott and edgy Jason Wu handbags dominate, evoking a sort of refined, professional vibe. Maram’s portion is indeed more youthful and hip. Pillows with large red lip prints by American Retro sit on shelves, and mannequins are dressed in bedazzled OTT tops and plaid jumpsuits and asymmetrical ankle-length skirts by Maha Alhamed. “If she had a favourite item, it would probably be a blazer,” Maram interjects, and Maryah laughs in agreement, explaining that even when she was at school she stuck to a classic, reserved look. Maram, on the other hand, says she is willing to take risks with her style, particularly by embracing colour and a more casual aesthetic. Fashion has long been a family affair for the Al-Dafa family. Their foray into the business began 10 years ago, when Maryah, Maram and their mother opened Arabella, an eveningwear store in Doha’s Royal Plaza mall. It was the first boutique in the country to sell Vera Wang ready-to-wear gowns. So when the renowned designer sought to launch a flagship store in the GCC – her first outside of the United States – naturally, she approached the Al-Dafas. Maryah and Maram opened their Vera Wang store in 2009 in the same space as their current Eqlipse venture, and until 2013 they sold the designer’s bridal dresses, as well as ready-to-wear pieces. “We were really successful. Saudis would come, Emiratis, Kuwaitis and Qataris… But four years later when our contract was up for re-negotiation, Vera Wang said they wanted to start splitting bridal and ready-to-wear in all of their stores. But we explained that it won’t work if you split them in Qatar – we’re not there yet retail-wise. We do well because we have them both together,” Maryah recounts. Maryah and Maram offered a different solution: they had dreamt of opening their own multi-brand store, and they negotiated with Vera Wang, who agreed to continue selling her ready-to-wear styles through them. With Wang on board as well as a slew of other designers (Amanda Wakeley, Ragged Priest…), Eqlipse was born, and the sisters celebrated a soft opening of the boutique in the summer of 2014. Though she recoils at the cliché, Maryah acknowledges that she has longed had “a passion for fashion.” It stems from her family’s many years living abroad. Her father, Bader Al-Dafa, is a seasoned diplomat and former ambassador to the United States. As a result of his profession, Maryah and her family have lived a cosmopolitan existence. Maryah herself was born in Spain and Maram in Paris. They settled in Washington, DC, for their father’s ambassadorship, when Maryah was in her second-year of high school. “When were living in the States and when we would come back and forth between countries, we knew there weren’t a lot of retail options in Qatar. And if there were, it was very kind of standard clothing – there weren’t the kind of up-and- coming designers that were young or a little bit bold. So we thought why not open our own [boutique],” she recalls. Owning several successful, high-end retail boutiques would be enough for most ambitious women. But as I quickly discover, Maryah is a polymath – a modern-day Renaissance woman, talented and skilled in very disparate fields. Maryah attended Georgetown University in Washington, DC, where she earned a bachelor’s in international politics in 2007. Three years later, she was awarded a master’s degree in the same field from the School of Oriental and African Studies at the University of London. Initially, she had hoped to follow in her father’s footsteps until she learned that, at the time, Qatar did not allow women to become diplomats. “I didn’t work hard to be in admin only. I didn’t expect to be an ambassador, but I at least wanted to be in the diplomatic corps,” she states. Though not an official policy, Maryah says that at the time, cultural norms by and large prevented women from rising to those ranks. That changed when Qatar appointed its first female ambassador in 2011. Nevertheless, in the interim Maryah found satisfaction working in the research and public sector. From 2007 until 2010, she was an associate policy analyst for the RAND-Qatar Policy Institute. Simultaneously starting in 2007, she devoted herself to cultivating new initiatives at Qatar Foundation. Founded by the former Qatari first lady Sheikha Mozah, the non-profit organisation fosters education, scientific and research development in the country. Recently Maryah was promoted to acting communications director and project director for the Office of the President at the Foundation, where she helps to manage international partnerships and implement new projects coming out of the Foundation’s other centres. She has no plans to slow down, presently mulling over the possibility of pursuing a PhD in public policy in the near future. In the meantime, however, she also has dedicated herself to various philanthropic causes. She supports and participates in Maktaba (or ‘Library’, in English), a non-profit founded by her sister-in-law Sarah Champa Al-Dafa. It provides free story-time sessions to children across Doha in an effort to increase their love of reading. Maryah’s credentials are impressive (I would be remiss not to mention that she speaks three languages fluently: Arabic, English and Spanish), and it’s miraculous she finds any time at all to run a retail boutique, but that is where her sister comes in. Together, Maryah and Maram do all of the buying for Eqlipse, with one covering for the other at international fashion weeks if school or day jobs get in the way. What impresses me most about the Al-Dafa sisters is their deep partnership and support for one another. Maryah’s example has certainly rubbed off on Maram, who is about to graduate from Georgetown University School of Foreign Service in Qatar with her own bachelor’s degree in international politics, and where she serves as the secretary general of the Model United Nations program. Perhaps one day they will emerge as a sisterly tour-de-force in Qatar diplomacy. But for now, they seem focused on becoming a power duo in fashion. Though not designers, their eye for haute couture is keen, and they see a remarkable fashion transformation occurring among Qatari women. “We are seeing a more diverse range of tastes – people who dress like me, and people who dress like Maram,” Maryah says. However Doha’s fashion consciousness continues to evolve, Maryah and Maram are certain it will retain a distinctly Qatari flair. And ultimately, they say, that is what will set it apart from the rest of the Gulf. “Dubai is one of those places where all of the international brands are there, but there is nothing Emirati about it. Dubai is touristy by nature. There is a huge kind of purchasing power – it’s not just Emiratis, everyone international is going to Dubai to buy,” Maryah says. “We don’t have that, but what we do have is more Qatari. The international designers we have you can find anywhere else in the world, but there’s also a lot more focus on local designers, GCC, Saudi and Emirati-wide. And more and more there is a lot of involvement with Qatari fashion bloggers. In Dubai, fashion bloggers are not Emirati, they’re expats. 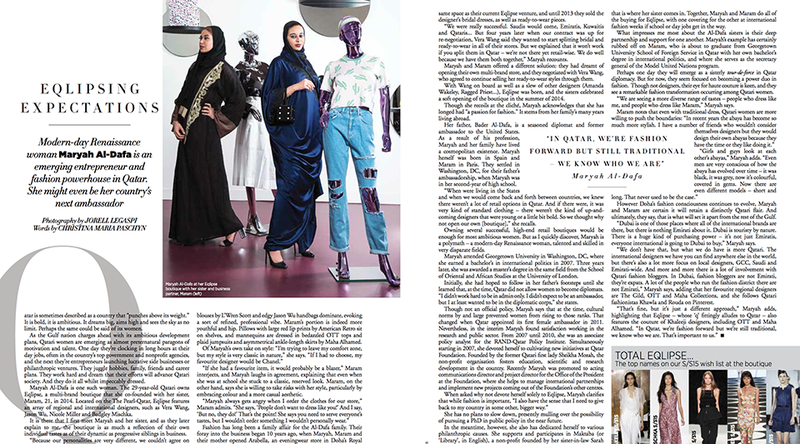 A lot of the people who run the fashion district there are not Emirati,” Maryah says, adding that her favourite regional designers are The Gild, OTT and Maha Collections, and she follows Qatari fashionistas Khawla and Rouda on Pinterest.